This portfolio's goal is income replacement. Every single company that I own pays dividends. Nearly all of them pay once a quarter, except Realty Income (O) which pays every month. The dividends of every company that I own has been raised every year. The large majority of companies that I own have been raising dividends for more than 2 decades. At the time of writing my income has grown to over $10,000 in dividends a year. I do not hold many high yielding companies as they are riskier. I am conservative in my selection of companies. I am averaging 2.6-2.8% in yield in my portfolio. Chasing yield has burned me in the past and I tend to prefer high credit rating low payout ratio companies to high yield. 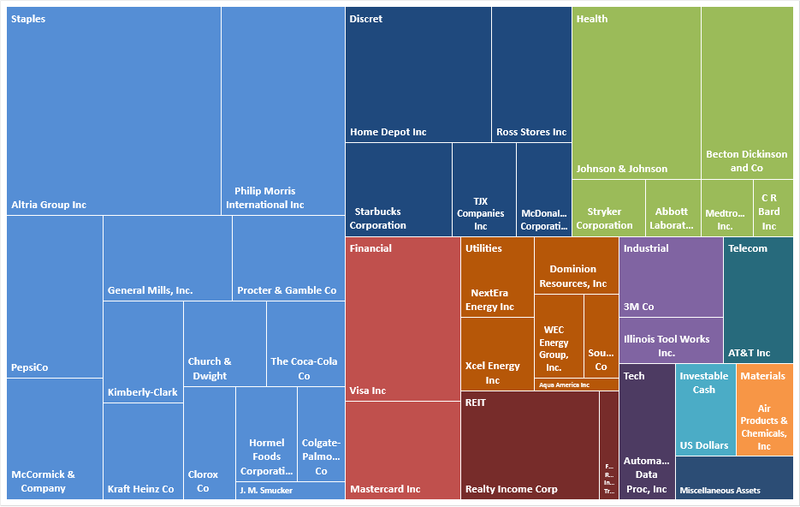 Below is a treemap of my portfolio holdings. I have most of my weightings in consumer staples. I p refer non-cyclical companies. I need to make sure the dividend is safe since I do not want to see a drop in my annual dividend income. Cyclical businesses like oil and materials and industrials have boom cycles and bust cycles. I do not want to partake in such roller coasters. Companies I prefer are those that offer products and services you and I use every day. We simply cannot live without these products. In consumer staples land, this includes products like cleaning products, addictive products (alcohol and tobacco), food and drinks, and personal care products. In the healthcare side these can include disposable equipment like needles and gloves used in hospitals to medical tools doctors use to treat patients to common drugs like Tylenol, Pepto Bismol, or sleeping pills. If one becomes sick or is on the verge of dying, one borrows money or pays a lot of money to see the doctor and tries to get their problems fixed, end of story. For financials, I have been a big advocate of MasterCard and Visa. I see them as the future of developed countries. There is no need to use cash anymore and the incentive to get cash back and the ability to "borrow" makes credit cards very attractive. I want to profit from this cashless trend and MA and V are my main picks. I prefer MA and V over others like Discover and American Express because MA and V do not lend to the end user (which is risky). MA and V offer toll road type of service which is a much less risky high margin business. Even if the economy has a recession, people still need to purchase basic survival goods and services. And people in developed countries will carry plastic not wads of cash. My portfolio sits in the $384,000 range but can move up or down a few thousands of dollars depending on market sentiment. My portfolio has grown to a point where daily market fluctuations starts to be quite large compared to my periodic contributions. Since the last few weeks have not been kind to my portfolio, especially the food company stocks and other consumer staples companies, I have seen no growth in my overall portfolio value. The declines in several of the companies that I own including my most heavily weighted position in Altria has been offset by my periodic contributions. I have no intention of selling Altria. In fact I am looking to add more to my large position if Altria falls below $60. I find the FDA announcement to investigate reduction of nicotine in cigarettes as something that has no material impact to Altria's top and bottom line right now nor in the coming years. This is something that will take a very long time to materialize (if ever). And Altria has always been part of large laws discussions with the government regarding tobacco. Altria has the best negotiators and businessmen to sort out an agreement with the government to establish a scenario that proves profitable to Altria, as seen in the Master Sourcing Agreement in 1998 which was a genius agreement between government and Big Tobacco. In effect, Big Tobacco and Government are both partners in the tobacco industry. Both want to see growing earnings in the business as Governments need the tax income to support their programs. Below is a chart of my dividend income. The spike up is my recent additions to my portfolio that cause my annual income to reach 5 figures ($10,028). I plan to add more to my portfolio throughout the year and I think I can hit somewhere between $10,600-$11,000 by the year end. 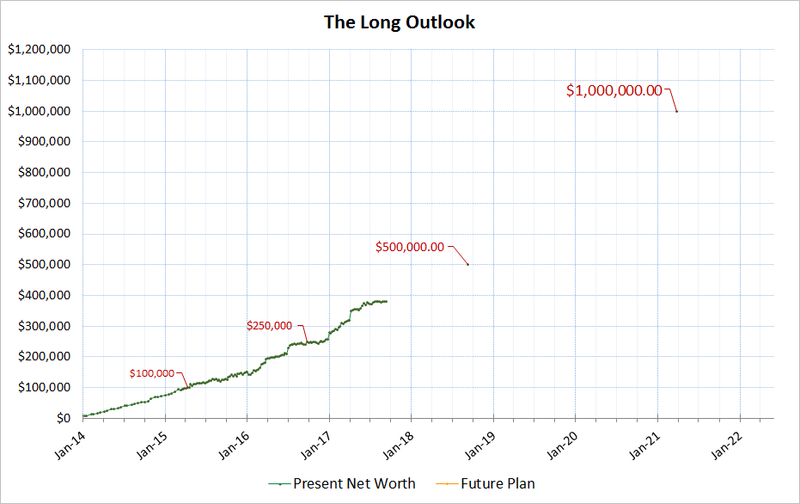 I am estimating that my portfolio's net worth can hit around $400,000 by the end of the year. But this largely depends on market fluctuations. Stay tuned for next month's report. Happy investing. 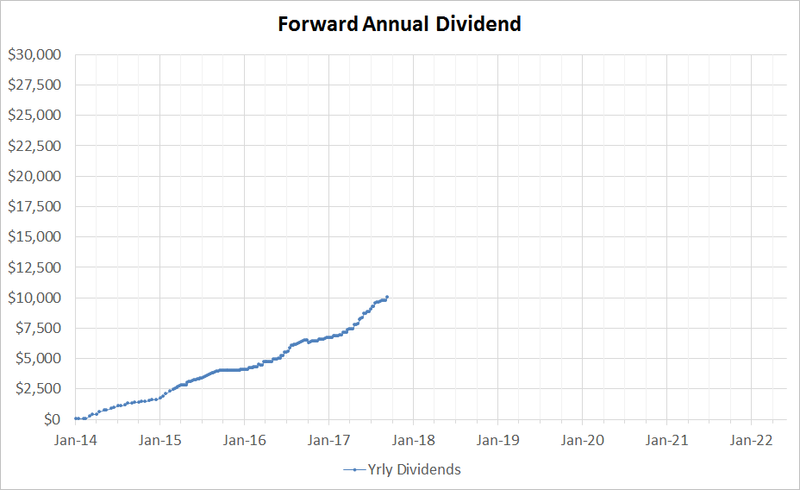 Fantastic, over 10k for forward dividends, that is a fantastic milestone, well done to you!